The only thing keeping them alive is...hope. Your gift before April 30 will be matched - up to $300,000 - to save 2x as many dogs and cats, thanks to generous contributions from AHS Guardians Circle members. Rescued from a cruel situation in northeast Georgia, Abigail and 77 other dogs had lived their whole lives in squalor with dirty water, little food, no medical care, no love. Your support today cares for animals like Abigail. It provides them a soft place to rest and healing medical services. Without your support, these animals will have nowhere to go, nowhere to heal, no one caring for them. 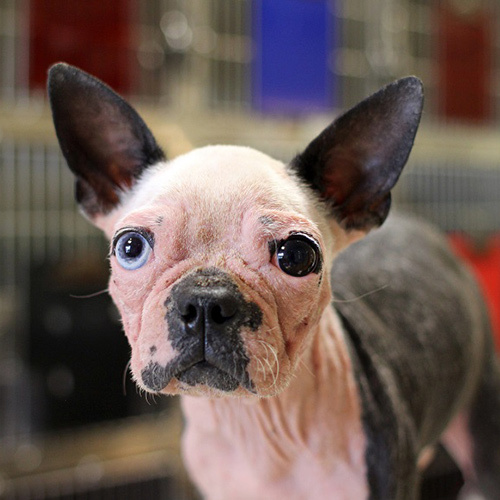 Please give today to save all the animals like Abigail still out there waiting...and hoping. To make a gift by mail, send your check made out to Atlanta Humane Society to 981 Howell Mill Road NW, Atlanta, GA 30318. To make a gift by phone call (404) 974.2895. Yes, I'd like to receive email updates from Atlanta Humane Society.